August and September mean there are many long days and nights here at Bogle Vineyards as we bring in the lots of fruit from the fields to the winery. We are in the middle of the fall crush, and it is our favorite time of year as we get ready to turn the grapes into wine! We are experiencing a bountiful year and are expecting a great result in the bottle. Of note, the reds we are pressing are much darker and deeper in color than any of us can remember in previous harvests. The deep color means this vintage will have big structure and more weight on the pallet than we typically expect from our red varietals. We are finishing up the last of the Clarksburg Chardonnay and will soon be turning all of our attention to the final Merlot and Cabernet grapes in the finals weeks of crush. It will be 1-2 years before we get to share these wines with you and we believe you’ll find as we do good things come to those who wait. “March 12, 1992.” That is the date Chris Smith joined Bogle Vineyards. He can recite as quickly as if it were last Thursday. He says it is easy to remember because it was the day he made one of the best decisions of his life. “I always wanted to live in an agricultural area and knew it would be a great place to raise a family,” said Chris. “Looking back now, it is easy to see how the move to Clarksburg has had such a positive imprint on my life. In the early days, his wife Chi, his son Jeremy, and daughter Natasha, would only be a few steps away from Chris at all times. Not only did Chris work on the Bogle Ranch, the Smiths also lived on the Merritt Island property. Originally Chris was hired as the winemaker, but the job included a lot more than trying to find the right blend. It was common to find him loading the truck with fruit, moving grapes with the forklift, running the crusher and even rebuilding the bottling corker when it went down. Even with Chris’ limited knowledge in mechanical engineering, he was always willing to learn and take on new roles. After 23 years with Bogle Vineyards, Chris has ascended from Winemaker to Director of Winemaking to his current role, Director of Wine Growing. In this role, Chris travels up and down the state meeting with Bogle Vineyard’s partner growers to ensure that exacting quality and farming practices remain consistent year in and year out. While no longer on the ranch each day as he was in the early years, Chris says after two decades he still enjoys coming to work every single day. 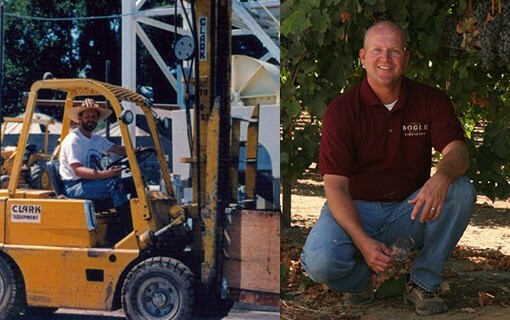 The photos above show Chris working crush in the early days on the job with Bogle Vineyards, and Chris in the vineyards today. Thank you to all of you who attended our Friday Alfresco events throughout the summer. The Bogle family is committed to being active citizens in the local community. 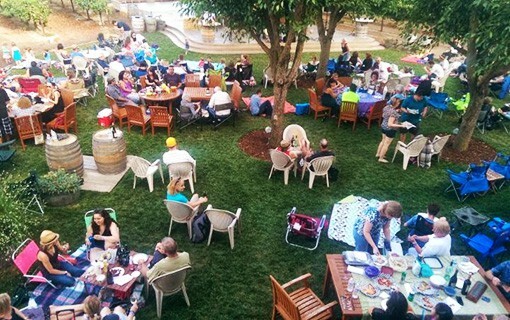 Our Alfresco events raised more than $14,000 for nonprofits in the Yolo and Sacramento County region this summer. Approximately 2,700 visitors came to the winery to eat local foods and listen to local bands play each Friday night from June to September. We hope to see all of the great nonprofits, bands and food vendors again in 2016! Sixth generation farming family Warren, Jody and Ryan Bogle held their first ever Bogle Uncorked event at the B Street Theatre in Sacramento Thursday, August 27. 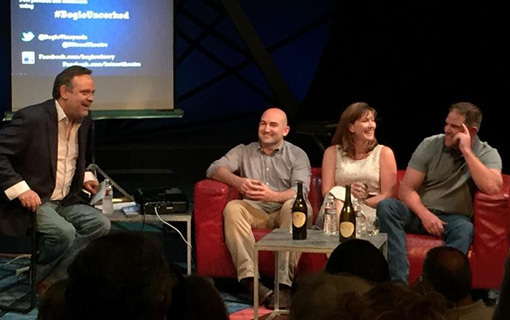 In front of Bandwagon Wine Club members and B Street Theatre supporters, the siblings told stories and shared memories of growing up on the Bogle Ranch. Jody, Warren, and Ryan all spent their younger days working in the fields, and each has come back to the family business, finding their own niche. Warren serves as President and Vineyard Director, Jody in Public Relations and Ryan as Vice-President and Chief Financial Officer. All three are committed to creating a great bottle of wine that anyone can enjoy. “It’s pretty simple: quality, value and consistency…that’s our philosophy,” says Warren. The family would like to thank everyone who came out to the event and looks forward to hosting another Bogle Uncorked in the future. Photo above: Ryan, Jody and Warren Bogle on stage at Bogle Uncorked at the B Street Theatre in August. 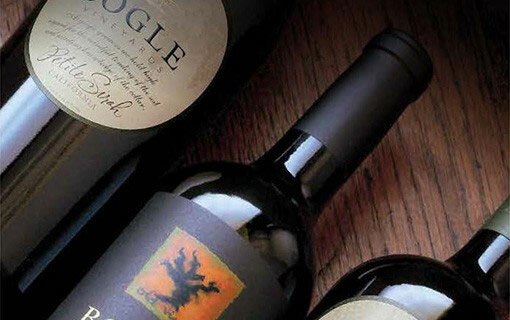 Bogle Wines have gotten some great press recently! We want to thank all of out regional, national and international media for continuing to recognize the hard work all of our staff puts in to make quality, consistent wine each and every year. Look out for the November issue of Wine Enthusiast magazine where both our Essential Red and Chardonnay wines received 89 points and Best Buy award! Last week, Bogle’s 2013 Petite Sirah was named Wine of the Week by The Santa Rosa Press Democrat. Read The Press Democrat’s complimentary article here.